This entry was posted on Wednesday, August 5th, 2009 at 12:19 pmand is filed under Pasta, Recipes. You can follow any responses to this entry through the RSS 2.0 feed. You can leave a response, or trackback from your own site. This is sort of my favorite too. I grew up in Malaysia, so I didn’t really get too much exposure to Italian cooking. But one time my dad took me to a restaurant and against most things I ordered spaghetti bolognese. After that it was pretty much the best thing ever for me, whenever eating ‘italian’ and such. It’s cool that you put your mom’s bolognese recipe online. I think lesser people would not have dared it. Like they’re afraid of something or other. 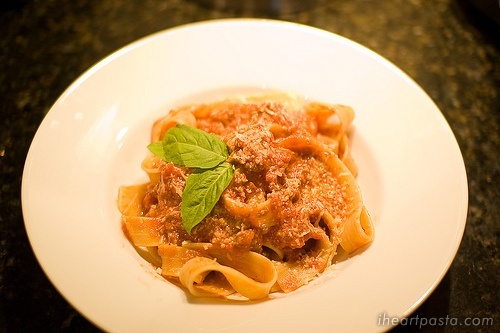 That dish looks so yummy, (not because it is my sauce), the pappardelle really makes the dish art-worthy. Beautiful presentation! and presentation. this is like, the best bolognese. thank mss. Thanks that was a great read. I can’t believe it myself, but it’s my wife’s and my 10th anniversary next month. Our first anniversary was in Italy, and we had some amazing shrimp pasta in this little cafe in Rome. I’ve been looking all over the web for a good recipe to see if I can’t make some myself, and I even found a shrimp pasta recipes site full of them!